Many everyday products used around the home or on the property contain a range of chemicals which can have an impact on health or the environment. These include paints, cleaning agents (such as detergents, varnishes or cosmetics), herbicides (weed killers) and pesticides or insecticides, baits and treatments to protect wood or pets, as well as fuel and fertilisers. These chemicals are often dangerous, some are flammable, most are poisonous, and all can harm the environment if used incorrectly. In the Sydney drinking water catchment, landowners have the responsibility to ensure that chemicals do not find their way into farm dams, waterways, wetlands and groundwater. This includes properly managing contractors using chemicals on your property. Keep all chemicals in an area specially designed for this purpose. Pesticides last longer with safe storage, and people, animals and the environment are protected. Use the right chemical for the right job and follow the instructions on the label, including information on the quantity of the chemical to be used (seeking advice on training requirements). When using pesticides, check the weather and do not spray if it is too windy, very hot or humid and follow any weather warnings on the label. Use personal protective equipment (PPE) and let your neighbours know what you are planning. When spraying, keep pesticides or herbicides away from waterways, plants and animals. If transporting farm chemicals, you are responsible for doing so in a way that protects yourself, other people, their property, animals and the environment. If any spills occur, the main steps are to isolate, contain, decontaminate and dispose. In the drinking water catchment, contact the fire brigade on triple zero to report or get help to clean up a chemical spill. Landowners are legally responsible for the safe use and disposal of farm chemicals. 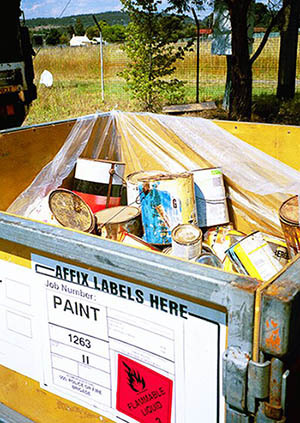 National programs called drumMUSTER (recycling chemical drums) and ChemClear (disposing of unwanted agricultural chemicals) have been set-up to help landholders safely manage their farm chemicals. Also contact your local council about disposing of other unwanted household chemicals. Do not dispose of chemicals in any form down drains, gullies or watercourses. Avoid applying pesticides before rainfall, and take extra care when spraying near farm dams and creeks. For more information, see managing your chemicals. Find out more about safe use of pesticides in NSW and any pesticide records you need to keep. For oil collection and to find about other recycling services in your area, contact your local council.